The Nautilus is located directly on the beach in Ft Walton Beach/Okaloosa Island. My beautiful, two bedroom, two bath condo (sleeps eight) is considered to be one of the best decorated units in the complex. My Non-Smoking condo has a beautiful view of the Gulf waters from the living room and the master bedroom. The master bedroom has a king-size bed, and wall-to-wall glass doors which open to the balcony. You will also love the double vanity in the master bathroom. The guest room has a queen-size bed and custom built bunk beds. There is also a queen-size sleeper sofa for additional guests. The condo has a fully-equipped kitchen, with a separate under the counter ice machine, and a WASHER and DRYER in the unit. There is a large pool (solar/gas heated when necessary) with a boardwalk that leads directly to the beach. Wi-Fi included' Plus... 'FREE BEACH SERVICE!' I am renting my condominium for Great Prices!!! See below for details! I have traveled many parts of Florida over the years, but Ft Walton Beach/Okaloosa Island soon became our favorite beach. I found ourselves returning year after year, so I decided to buy our condo in 2002. I did a lot of remodeling and upgrading to my 2/bedroom 2/bath condo, so I must say... My place looks great! What's not to love!! Location, view, clean, amenities (pool & outdoor shower), a few steps to the beach, beach set up of 2 chairs and umbrella included each day, plus extra beach chairs and toys, noodles to float, cooler and a well stocked kitchen. Oh my...what a well stocked kitchen. We only ate out 2 meals while there...we cooked the rest of our meals. We had plenty of everything that we needed. Loved it! I'd recommend this unit for sure! This place was perfect for our family vacation! Short walk to beach and condo was stocked with everything you could want or need. Away from hustle and bustle of destin, but a 6 mile drive if we wanted in on the action. Beach was beautiful! And we have never seen so many dolphins playing just past the sand bar. Better than anything money can buy! My girl friends and I had a wonderful time at the condo. Everyone had enough room to sleep and relax, the kitchen had all the cooking ware we needed which helped us save money and bond since we could just cook our meals together. We were super greatful for the collection of books in the condo, we even pulled out some of the board games like jenga on one of the days when it rained. The cable came in handy on that day too. On days when it was sunny and warm the beach was such a close walk. We found sand dollar pieces and walked to the pier which you can see in the distance. The short walk to the beach was taken advantage of, we went out at least once everyday. Overall I would say this was the most inviting and comfortable trip I've had to the beach. Great for our big family! We had a wonderful time staying in your condo! 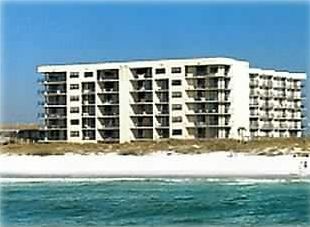 We have a large and young (4 kids under 7 1/2) family, but your condo was so perfect for a "white" Christmas on the beach. The condo was clean and fully equipped, even with board games and beach toys to go along with the cable TV and DVD players. Having the full kitchen helped us save some money, and bake Christmas cookies for everyone! The kids especially loved having the build in bunk beds, and the ease of walking right down to the beach, while mom and dad loved having their own romantic master suite with a view of the beach from the bed! The Nautilus building itself was quiet and staffed by incredibly friendly and helpful people. The location right between Fort Walton and Destin couldn't have been more perfect. Thank you for an unforgettable week! We will be back! Our stay at your "Little Piece of Paradise" was just that! Paradise! The condo was clean and inviting. The king size bed in the master bedroom was very comfortable. The kitchen was well stocked and big. The icemaker really came in handy for the daily trips to the beach. Having the beach service was awesome. Thank you so much for the use of your condo. I would recommend your place in a minute! This condo provides a home like feel from the first time you enter. Kitchen well stocked, Free standing ice maker is wonderful for preparing to go to the beach all day. Bed in the master bedroom is very comfortable. Slept great every night! The second bedroom was great for storage of all our beach toys but would have been great for another family visiting as it has a queen bed and bunk beds. View of the Gulf of Mexico is very nice, especially when you are winding down in the evening with a drink. Unit is very quiet. Rarely hear noises from other units. The swimming pool was always clean, the access to the beach is close and easy to access. I can only call our two weeks at this condo as vacation bliss. I highly recommend it to any couple or family!! !